In the June AMSOIL Magazine there was an article with vehicles factory-filled with synthetic oils. Was it by design to omit the Corvette from that list? I am sure there are more cars and maybe trucks now factory-filled with synthetics like European cars and even motorcycles. Could you compile a complete list and make an article out of that info, or at least pass it along? Also a list of vehicles that recommend synthetics would be nice. I am not sure how to go about it, but putting all diesel oil in a group or class would be worth looking into. Keep up the awesome job making the AMSOIL Magazine better. AMSOIL: The Corvette is indeed factory-filled with synthetic motor oil, as mentioned in the body of the article. The list, however, is not exhaustive and highlights only the top selling vehicles factory-filled with synthetic or synthetic blend motor oils. Those interested can view the online owner’s manuals for many vehicles sold today to determine the factory-fill oil and service fill recommendations. I am selling AMSOIL on a part-time basis at this time along with working one fulltime and one on-call job. Believe it or not, I do have time for all three. I am trying to do my best at all three, but it seems everytime I turn around I run into a wall with AMSOIL. If it’s not a price hike (which can be explained) or problems with accounts complaining about having to pay shipping when no one else charges it, now it’s a new Dealer website. I don’t have time to learn a new Dealer website when there was nothing wrong with the old one. Everything was there in plain sight and easy to get to. Please try to KEEP IT SIMPLE. AMSOIL: While we realize any change comes with a learning curve, the new Dealer Zone's flyout menus, large graphics and enhanced search function are designed to improve navigation, ease of use and searchability. We're confident with time you will find the new Dealer Zone to be an improvement. In fact, the positive comments AMSOIL has received regarding the new Dealer Zone have outweighed the negative. I am a Preferred Customer and have been using AMSOIL products for seven years. I just started to use it in my 2010 Chevrolet Silverado 4×4 1500 Series with the 5.3 L code 3 engine. I am finding the installation and the removal of the EaO50 oil filter is very difficult being the length is so short. Maybe using a cup/cap type filter wrench instead of the strap type could make things easier. It could stand to be about 2” longer without it sticking out and causing other issues. I realize this would add to the cost. The filters tend to be getting smaller in size as time goes on. I also find the smooth finish on these filters (I also use EAO64) make installation and removal a bit difficult. It sure would be nice to have the 1” grip type band that the Fram filters have. Are there any plans to incorporate any changes to the Amsoil filters? AMSOIL: The EaO50 oil filter's size cannot be changed. Ea Oil Filters are manufactured to meet OEM size specifications to ensure they fit every application for which they are designed. AMSOIL is currently investigating technologies for the next generation of Ea Oil Filters, and your suggestion regarding finish will be considered. Variables as diverse as raw materials procurement, product blending, packaging, distribution and more directly affect every AMSOIL product used by every Dealer and customer each day. Much of the responsibility for ensuring only competitively priced, premium products reach endusers falls under the banner of the AMSOIL Operations Department. 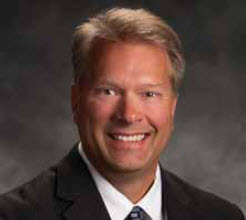 Vice President of Operations Scott Davis spoke with AMSOIL Magazine about cost control, new projects and more. One of the primary tasks of the Operations Department is the procurement of raw materials. With the recent volatility in the oil market, how difficult has it been to maintain costs on raw materials? To say raw materials procurement is a challenge in this environment is an accurate statement. With the disruptions of raw material supplies in recent years, procurement has taken on a whole new level of importance in our business success. Because AMSOIL is an independent manufacturer, we can compare pricing from multiple suppliers and purchase from the supplier that delivers the quality we demand at the lowest price. So we shop around. Additionally, with our investment in the bulk storage facility at the AMSOIL Center, we are able to soften short-term raw material increases by managing inventory levels appropriately. What else does AMSOIL do to control costs? AMSOIL has a great relationship with industry suppliers, and that more than anything has helped us weather the storms effectively. However, since AMSOIL is a blender and not a refiner of its own raw materials, our costs fiuctuate with market conditions. AMSOIL makes every effort to ensure an uninterrupted supply of raw materials while controlling costs as much as possible. Although challenging, we do everything we can to keep AMSOIL products competitively priced. AMSOIL is involved in green initiatives that not only benefit the environment, but contribute to reduced prices on lubricants, literature items and more. Can you explain? AMSOIL is a certified “Count Me Green” manufacturing company. This is the result of a third party evaluating our energy efficiency, recycling programs and employee awareness as it relates to sustainable manufacturing processes. We have a robust recycling program that results in only one dumpster of waste generated every six weeks for our entire 400,000-square-foot facility, and two semi loads per week of recyclables. AMSOIL recycling initiatives include everything from corrugated liner board to batteries, light bulbs and oil filters. It results in positive revenue for waste disposal every year, which helps reduce operating costs. Turning to manufacturing, how do AMSOIL manufacturing processes compare to others in the industry? I am convinced that AMSOIL manufacturing technology is well beyond the lubricants industry as a whole. This was an obvious step for the company, as we recognized that the best lubricants cannot remain the best with traditional blending technologies. In 2007, AMSOIL invested heavily in a bulk blending and packaging upgrade that established a foundation of industry-leading technology for blending lubricants. This technology provides AMSOIL products a level of consistency recognized by our competition and valued by our customers. Our facilities not only ensure we meet growing product demand, but also provide the tools necessary to improve our already great synthetic lubricants. What is AMSOIL doing to maintain its status as the industry leader in manufacturing technology? We continue to invest in processcontrol and process-monitoring technologies. Recent examples include the addition of in-line weigh scales on the quart packaging lines, providing increased accuracy and, ultimately, cost control. We also visually inspect for accurate cap colors and case quantities, improving efficiency. Updated lab equipment adds to the capability and effectiveness of the laboratory staff. Recent additions to the lab equipment ensure we remain the industry leader in product formulation and product offerings. AMSOIL Operation’s stated mission is to provide customers “what you want, when you want it, with a service level that meets or exceeds your expectations the first time and every time.” What does it take to accomplish this mission? Obviously it starts with premium products that perform up to our customers’ expectations. It continues with shipping orders in 24-48 hours, which happens 98 percent of the time when backorders do not interfere. It means we do our best to listen to customers and implement their feedback, which drives many of our investments in process controls and monitoring. For example, a single quality concern stood out recently during a comprehensive review of customer feedback. In this situation, AMSOIL had received a total of nine complaints over the course of a year for a packaging-related concern. Nine complaints out of millions of packages would not make most companies’ lists of things that needed to be fixed. However, AMSOIL considers anything less than perfect not good enough. A process monitoring technology was installed to ensure our customers could depend on our product leaving the AMSOIL Center undamaged 100 percent of the time because that is what we strive for in this company. Many customers are concerned about rising shipping costs. What is AMSOIL doing to control those prices? Ninety-two percent of AMSOIL products are shipped at least one time, and 85 percent are shipped twice, making shipping costs an important factor for all Dealers and customers. Freight costs continue increasing in lock step with the price of oil, including base shipping costs, fuel surcharges and other accessory surcharges. In fact, since AMSOIL last implemented a shipping rate increase in 2008, our costs have increased 10.8 percent for parcel deliveries and 7-11 percent for base truckload deliveries. In addition, LTL rates have fluctuated. usiness to fill their truck while AMSOIL receives a reduced rate, benefiting everybody. 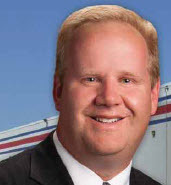 What new improvements are planned for AMSOIL Distribution Centers? AMSOIL is stronger than ever and continues to demonstrate vigorous growth. To meet current demands and prepare for future growth, major expansions are complete at our Columbus, Lancaster and Las Vegas Distribution Centers. All three DCs received more square footage and upgrades to their show rooms, including new fioors, paint and displays. Additional distribution center growth is planned in 2011 for Edmonton, Toronto, Richmond, Dallas and Chicago. Are any projects underway at the AMSOIL Center? Yes. Packaging operations are progressing through the addition of two packaging lines that will provide the ability to respond to changing market demands. This will allow AMSOIL to remain responsive to our customers’ needs as our product line continues to expand and add package sizes. Finally, in true AMSOIL fashion, projects related to our facility that will ensure a strong future and reduce our operating costs are also in progress. These projects include infrastructure repairs, including roof repairs, back-up power systems and utility upgrades. All of this work has considered the future of the company, with a focus on providing substantial energy savings and sustainability for years to come. The future looks amazing, so it is important to take care of things as we go. The 2011 AMSOIL Offshore Powerboat Series kicked off in Sunny Isles, Fla., and leading the charge through an exciting weekend of racing was Team AMSOIL offshore racer Bob Teague. Teague joined forces with his son, John, for Friday’s Miami to Bimini race. Despite choppy waters, Team Amsoil finished first with a roundtrip time of one hour and seven minutes. Teague teamed back up with his main driver, Paul Whittier, for the opening round of the AMSOIL Series. Following qualifying and testing on Saturday, the team was well-prepared for Sunday’s Cat Lite race. Three exciting head-to-head matchups ensued, and a battle between Team AMSOIL and Phoenix Parts was the featured duel of the day. While Phoenix Parts took an early lead and controlled the inside lane, it didn’t take long before Team AMSOIL found its groove and pushed into the lead, eventually winning by more than a minute. The AMSOIL Offshore Powerboat Series will be televised on Versus starting in October. The one-hour shows will feature a true behindthe- scenes look at the top teams in offshore powerboat racing. See https://www.amsoilracing.com/Series/ AMSOILOffshorePowerboatSeries.aspx for a preview. Top: Douglas plows through the mud en route to his opening-round Pro 4×4 class victory. Top Right: Douglas (center) celebrates atop the podium with Ricky Johnson (left) and Mark Jenkins (right). Bottom Right: Oberg opened the season with a third place podium in the Pro 2wd class. The 2011 Traxxas TORC Series presented by AMSOIL season opened May 28-29 at rain-drenched Red Bud MX in Buchanan, Mich. After TORC officials plowed roughly 12 inches of mud off the top of the track, defending Pro 4×4 champion Johnny Greaves grabbed an early lead with Traxxas driver Mark Jenkins and AMSOIL Super Team driver Scott Douglas close behind. Greaves relinquished the lead as he hit the infamous LaRocco’s Leap (redubbed L’il LaRocco for the TORC weekend) and beached his truck atop a berm of mud, allowing Jenkins and Douglas to take over the top spots. In a matter of moments, Douglas took control of the lead with Jenkins and Red Bull driver Ricky Johnson close behind. A mud-caked Douglas led the field to the mandatory caution, and on the restart, Douglas and Johnson set the pace for the remainder of the race. While Douglas showcased his legendary speed, former motocross star Johnson used his track knowledge to make ease of the whoops section. Douglas, who won the Oakley Bomb award for setting the fastest lap time, pulled away on the final lap for the win. Johnson took second and Jenkins third. The Pro 2wd class hit the track immediately following the Pro 4×4 podium celebration. Although the heavily rutted track took its toll on much of the field, Rob MacCachren took the lead while AMSOIL Super Team driver Mike Oberg found himself in a close battle for second with Scott Taylor. With just a few laps remaining, Taylor moved away from Oberg, but the AMSOIL driver kept pace to take the third-place podium. In the Pro Light class, AMSOIL Super Team driver Brad Lovell started mid-pack and found enough lines on the tight, winding track to push into third. However, with just a few laps remaining, he had to pull off the track with a mechanical issue, likely due to the heavy contact with other racers. Rookie racer Sam Hubinette took the win, followed by CJ Greaves and Andrew Caddell in second and third respectively. Patience is not a virtue often spoken of in racing circles. With the goal of getting to the finish line the fastest, patience is often pushed aside. Riding out front doesn’t happen overnight. Many times, especially in grassroots racing, it takes time to find success. 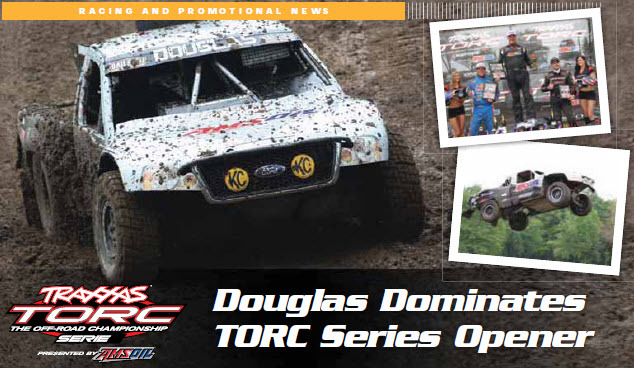 In 2009, Brad Lovell, an accomplished rock racer/crawler, was looking to build a short-course truck to race in the TORC Series. AMSOIL, a long-time supporter of Lovell that has witnessed his 95% podium rate firsthand, backed his new challenge. Lovell never reached the podium in the TORC Pro Light class during the 2010 season. Many sponsors might have turned their backs on the team, but we all knew Brad had the ability to succeed in shortcourse and, in 2011, patience proved its potential. Lovell led the first race of the year and finished second in Crandon in June. Many mechanical developments designed to reduce emissions and improve efficiency place added stress on lubricants and fuel systems. In recent years, mandated emissions reductions and new fuel economy standards have been the major drivers for new engine technologies. Application of improved engine technologies is accelerating to meet these mandates, challenging lubrication and fuel systems to operate accordingly. Two of the most common recently improved engine technologies include turbochargers and gasoline direct injection. Turbocharged engines have gained popularity with vehicle manufacturers for their ability to maintain or increase engine power while simultaneously increasing fuel economy. Turbochargers work by harnessing hot exhaust gases to drive a compressor, which in turn pressurizes air from the intake system to generate more engine power. Since turbochargers are continually exposed to hot exhaust gases, they stress lubricants far beyond other areas of the engine. High temperatures create the potential for localized sludge and deposit build-up in critical areas, which can lead to damage to the turbocharger and other parts of the engine if not lubricated and maintained correctly. Some engines equipped with turbochargers require warm-up and cool-down periods to avoid coking, which is when motor oil becomes baked onto the internal parts of the turbocharger. Penetration of foreign bodies into the turbine or compressor. These failures can generally be avoided with regular maintenance. Maintaining the air intake and filter, for example, helps keep the system running cooler and ensures that no random foreign material gets into the turbocharger. Many new turbocharger-equipped engines are designed to be consumer friendly and require little, if any, special intervention. For example, the new Ford EcoBoost™ engine has two watercooled turbochargers that continually circulate coolant after engine shutdown to insure the turbo is sufficiently cooled to prevent coking. Although this addresses some of the immediate issues, oil debris and localized excessive oil temperatures can still cause long-term issues. Gasoline direct injection (GDI) engines are becoming more widely used by vehicle manufacturers because, like turbochargers, they can maintain engine power while also increasing fuel efficiency in a GDI engine, fuel is injected directly into the combustion chamber rather than the intake side of the engine. GDI technologies from different manufacturers vary and component design is slightly different depending on the company. Some GDI engines have exhibited problems with carbon build-up on the intake side of valves. Oily residues build up over time and deposit on the back side of intake valves causing loss of engine horsepower, sluggish operation and poor fuel economy. One of the larger concerns is the potential for clogging fuel injectors. GDI systems operate under very high pressures and temperatures. The fuel injector resides inside the combustion chamber, so it is exposed to continuous cycles of high heat and pressure followed by cold-soak periods. This is a much more severe operating environment and deposit issues are more common than in engines with injectors on the intake side. Since GDI systems depend on high pressures to atomize the fuel, any disruption of flow through the small injector openings creates noticeable issues. This problem is so prevalent that a GDI deposit test was designed specifically to predict deposit formation and impact on fuel flow. So, with more change comes more issues and opportunities. Increased use of turbochargers places more stress on filter and lubricant technology. Lubricants must hold up to excessive temperatures created by use of these systems, and they must be able to quickly pull heat away from lubricated areas. In addition, oil filtration is critical as these systems continuously operate under high load and rpm. A slug of dirt particles in engine oil can tear up key bearing components quickly. Seems like a problem specifically designed for AMSOIL motor oils and high-efficiency filters. GDI technology has many benefits, but some significant issues. The Pressure-Cooker that is created by high temperatures, high fuel pressures and smaller fuel injector openings can certainly cause new issues for drivers. Varying fuel quality also creates another opportunity for AMSOIL Dealers to help prevent or eliminate the issue with AMSOIL fuel additives. Helping customers learn and find solutions to their problems is valuable. It builds credibility quickly, and if you do it well, you might just find yourself regularly converting customers to lifelong friends. Pittsburgh Regatta – Pittsburgh, Pa.
After opening the 2011 APR Superleague Formula 2 season with two runner-up finishes. Amsoil Team Racer Terry Rinker battled a talented field of competitors and some turbulent weather at the Pittsburgh Regatta for his first win of the season. A strong storm forced a half-hour delay to the start of the race. Upon the start, Rinker relied on his experience to navigate the choppy waters of the Allegheny River and take a comfortable 30-second win over 2nd-place finisher Rob DiNicolantonio. Rinker’s son, Rob, also had a good weekend in Pittsburgh. Rob Rinker set the fastest qualifying time and started on the pole for Sunday's formula 3 final where he finished 3rd. Rinker followed up his win in Pittsburgh with the victory and Vadakin Cup at the 11th Annual Riverfront Roar in Marietta, Ohio. After posting a blistering run in the time trials and finishing first in the combined overall qualifying heats, Rinker took off from the pole-position and led all 30 laps in the final, easily winning over Mark Jacob and J. Michael Floyd. Rinker holds first place in the APR Superleague points standings with four rounds remaining. Rob Rinker finished 4th in the formula 3 class and holds fourth in the F3 points standings. An increasing number of motorists are seeking 0W-20 motor oil, including owners of newer Toyota Camrys and Honda Accords, two of the best-selling cars in America. The problem is, many oil installers and retailers either don’t carry 0W-20 or do so at increased prices compared to dealerships. 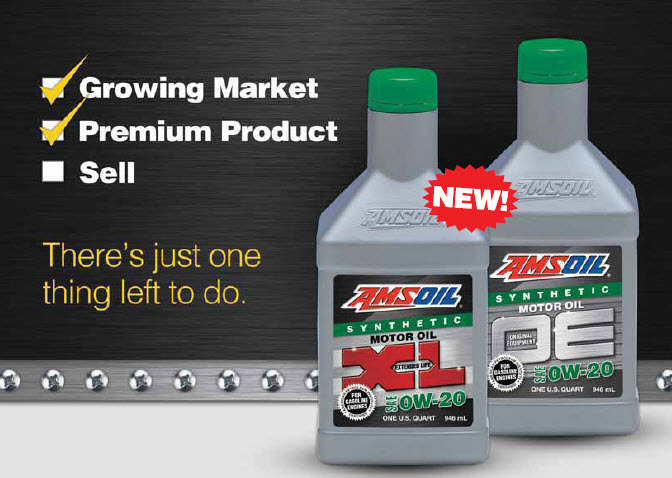 It’s time to introduce AMSOIL OE and XL 0W-20 Synthetic Motor Oil to installers and retailers in your area. Priced correctly, OE and XL help businesses attract this growing customer base while improving your sales. For everything you need to establish new installer accounts, order the Installer Kit (G250 U.S., G8250 Canada) or the Retail-onthe- Shelf Program Packet (G1001) today. Buggy through the Frame Twister. Ten teams selected by readers of Four Wheeler Magazine converged in Hollister Hills, Calif. over the week of June 6 to battle it out in the 2011 AMSOIL-sponsored Top Truck Challenge. Seven brutal challenges awaited. While most of the competitors emerged from the Tow Test unscathed, the Frame Twister presented a more serious challenge, requiring numerous extractions and preventing most of the competitors from even finishing. From there, competitors moved on to the Mud Pit, where Mike Keller and his 1976 Ford F-350 made it look easy by hitting the mud fiying and skimming along the top. Deep water and deeper holes greeted competitors on the second day of competition as they tried to navigate the Obstacle Course. The Hill Climb was next, challenging competitors to climb a 60° slope littered with holes and ditches. The Mini Rubicon was given an extra degree of difficulty this year. In addition to deep holes, competitors were forced to navigate through giant boulders. Faced on the final day, the Tank Trap was the competition’s most challenging event. 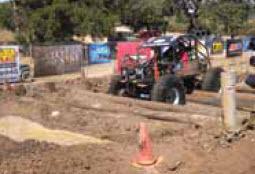 Huge water-filled holes swallowed trucks and wiped out some of the competitors, causing some to flip on the steep incline and require an extraction. Despite the serious difficulties, the 2011 Top Truck Challenge produced a pair of winners. Alex Sanders of Arkansas took the win in the Buggy class with his 2008 Chevrolet Buggy, and Steven Montpas of Oregon earned the title in the Truck class with his 1949 Willys pick-up. 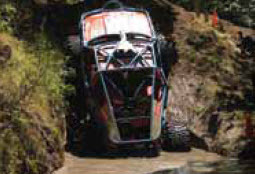 In 2010, Team AMSOIL racer Brad Lovell decided he wanted to tame the mountain in his back yard. The Colorado Springs, Colo. native had always looked at the Pikes Peak Hill Climb as a challenge, and last year, he took hold of his dream and entered his AMSOIL-sponsored TORC Pro Light truck in the Pikes Peak Open class, finishing third with an overall time of 13 minutes and 17 seconds. The race is set on a 12.42-mile course that features 156 turns and summits at 14,110 feet. The thin air robs engines of 30 percent of their power as they reach the top. Brad Lovell took advantage of the experience he gained last year to maneuver to the top in 12 minutes and 33 seconds, knocking 44 seconds off last year's time and finish second behind Randy Schranz. See https://www. amsoilracing.com/media for video of Brad’s race up the mountain. Roger’s day was quite a bit shorter as the rook racer flipped upon catching a tire in the loose gravel on one of the hairpin turns. 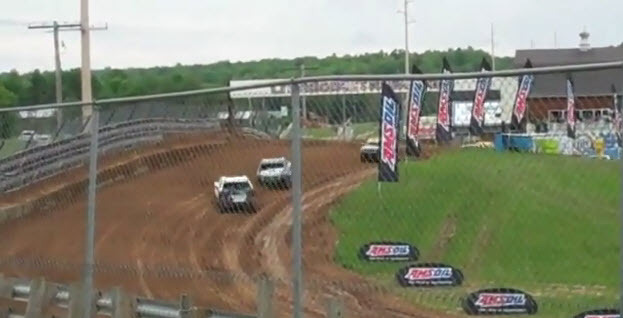 Check out video of the crash in the News section of amsoilracing.com. Inside Line provides race stories beyond the headlines. Off Track indicates what teams are doing away from race day, including trade shows and special events. Products the Pros Use incorporates the insight of the AMSOIL Technical Department on race-related products. Race Prep previews where racers or series will be that upcoming weekend. Pro Profile highlights a different sponsored racer or person each week. As Seen On keeps readers in touch with outside news articles, interviews and videos of Team AMSOIL drivers. There’s a lot going on at amsoilracing.com, and AMSOIL will continue to provide the latest news on what’s happening with Team AMSOIL. Amsoil synthetic lubricants figured prominently in the Vetter Fuel Economy Challenge held May 13 in northern California, where a diesel-powered motorcycle using AMSOIL products won by achieving 128.24 mpg. Many of the other bikes also relied on AMSOIL products to help achieve results nearly as impressive. Competitors completed a 133.5-mile course designed to provide real-world, challenging conditions. The trip, beginning and ending in Carmel, Calif., included mountainous terrain cresting a 2,500-foot pass, while the return ride along the famous El Camino Real subjected riders to 30 mph headwinds that tested the limits of each motorcycle’s fuel efficiency held at various places throughout the country, the Vetter Fuel Economy Challenge dates to 1980 and aims to encourage development of motorcycle technologies that improve fuel economy while remaining viable for everyday drivers. and Amsoil Lubricants through out. The winner must consume the least amount of fuel measured in dollars and cents while meeting all prescribed conditions. Hayes used $4.53 in biodiesel, essentially one gallon, to travel the entire 133.5 miles in challenging conditions, highlighting the bike’s impressive technology and the effectiveness of AMSOIL products. Hayes said his bike showed measurable improvements running Series 3000 5W-30 Synthetic Heavy Duty Diesel Oil and Diesel Concentrate, including easier shifting from the transmission. Competitors had to remain ahead of a trailing official at all times to prevent them from padding fuel economy statistics by driving slowly. Two bikes were disqualified for doing so. AMSOIL-sponsored Hayes-DT focuses on developing the world’s most cuttingedge, heavy-fuel-powered, light tactical vehicles and small engines for military use. In fact, key Hayes-DT corporate personnel have served in modern military conflicts deployed on Hayes-DT military motorcycles. 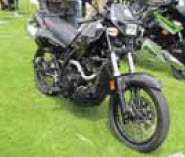 The bikes receive the most use from the Combat Military Police for route recognizance and convoy control. A second Hayes-DT bike, the Street Fighter, was disqualified after a battery problem caused it to miss the official start. Following repairs, driver Josh Chen rallied to complete the course anyway, achieving 90.82 mpg, which would have been good enough for third place. The Street Fighter used the same lineup of AMSOIL products as the MD670 F2. Although neither motorcycle is available to the general public yet, Hayes-DT is currently working on EPA and EU emissions certification. Until then, competitions like the Vetter Fuel Economy Challenge allow Hayes- DT to showcase the advanced technologies of their bikes and the performance benefits of Amsoil synthetic lubricants and additives.